I love a great t-shirt. Everyone likes to be comfortable. I'm always on the look out for unique t-shirts that fit into my great and comfortable ideology. I am currently crushing on this LNA Tee. From the front it looks like a basic t-shirt. From the back?! Ooh La La. It's got a lace back! 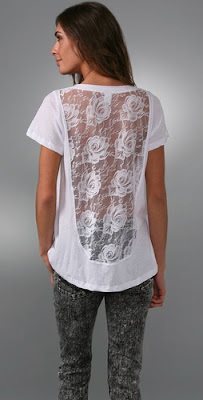 The lace back adds a touch of sexiness to an otherwise simple t-shirt.